Wanna be in our Top 8? After months in the oven, we're finally getting a taste of the freshly-baked New Myspace as the new owners let us poke around inside the revamped site. 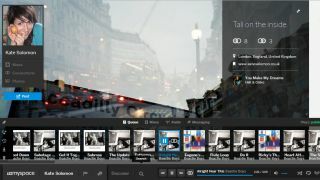 Myspace, lately bought for a song by Specific Media and Justin 'I design lamps now' Timberlake, has been almost completely rebuilt, to the point where only the Top 8 and profile songs are recognisable from its past self. It's clear that the new owners have worked hard to combat preconceptions of the site as a tired old packhorse to Facebook's thoroughbred stallion, good for not much more than a trip to the glue factory. That's because the new Myspace isn't trying to compete with Facebook or Twitter; it's got its sights more firmly trained on Spotify and Rdio – and, to a lesser extent, Flickr. And, sort of, portfolio sites. Plus, kind of, dating sites. Basically, there's a lot going on and it's difficult to know exactly where to start. The new site leans heavily on images, music and video; users stamp their mark on a profile with a giant cover photo – minimum resolution is 1024x768 - add a profile song, 'connect' to artists, albums and people and nose through contacts' playlists and music mixes. An ever-present player at the bottom of the screen shows your now playing and the play queue for songs you're streaming from Myspace's impressively-well-stocked music library. These 'connections' then populate the users' side-scrolling news feed and profiles. Myspace wants to be a creative hub rather than a traditional social network; the focus is very much on artists and how they can connect with fans but there are also tweaked profiles for people classing themselves as photographers, filmmakers and 'curators', among others. There's also a weird dating-type element to the site; you can search for people based on their age, gender and location, ostensibly to find people whose tastes are similar to yours so you can shill them for new bands but we can see this facilitating the kind of unsolicited 'hey, you're hot, wanna hook up' messages of yore too. We haven't seen much of the revamped, reinvented music site since a sneaky preview video caused a stir back in September - the site is still very similar. Unfortunately, you can't join the new Myspace yourself just yet; the site is still in private beta, with the company hopeful for a wider launch at some point in early 2013. Also to come are mobile apps (currently in alpha) and an intriguing-sounding Spaces section which will incorporate "curated apps and tools". Bonus fact: New Myspace has an excellent 404 error page.